Patients love miraDry. Many patients only need one to two treatments and leave knowing they no longer have to worry or be embarrassed by excessive underarm sweat," shared Dr. Scott Gerrish. Dr. Scott Gerrish is pleased to announce that Gerrish & Associates MedSpa offers miraDry treatments in their Northern Virginia locations. miraDry is a non-invasive, FDA-approved treatment that provides a permanent solution for excessive sweating caused by hyperhidrosis, a condition characterized by increased sweating that's more than what's required to appropriately regulate body temperature. "Patients love miraDry. Many patients only need one to two treatments and leave knowing they no longer have to worry or be embarrassed by excessive underarm sweat," shared Dr. Gerrish, "Treatment time takes approximately one hour, and some of our top referrals come from satisfied miraDry patients. I recently had a patient who suffered from severe underarm sweat. 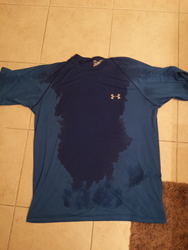 After just one miraDry treatment, he sent us a picture of his t-shirt after a workout, and there were no visible sweat marks under his arms!" The clinically proven miraDry system was developed by Miramar Labs and works by utilizing microwave technology to permanently eliminate underarm sweat and odor glands. As Miramar puts it, with miraDry, "the sweat stops here." Dr. Gerrish is Medial Director of Gerrish & Associates and Medical Director of the Coolsculpting by ZELTIQ Training Center East in Reston, VA. In 2016 Gerrish and Associates was voted best Med- Spa Readers' Choice Best of DC. He has been featured in leading local and national periodicals, including STYLE Magazine and The Washingtonian. He is considered one of the most experienced providers of non-invasive to minimally invasive cosmetic procedures and has trained numerous physicians on such treatments. Working directly with laser companies, he has helped develop advanced laser technologies. Dr. Gerrish completed his residency at The George Washington University Medical Center and has been delivering non-invasive to minimally invasive medical cosmetic treatments since 1996. Gerrish & Associates MedSpa has locations in Vienna and Alexandria, VA.
For more information about Dr. Gerrish and Gerrish & Associates MedSpa, visit http://www.drgerrish.com.